I improved the sound to a spectacular level by swapping in a pair of Tung Sol 6550s and 12ax7s. Anyway, glorious good was not good enough. So, I called Tash Goka, from Divergent Technologies and asked him for his recommendation for best tubes for this amp. He said, words to the effect, you already have them. Call Chris VenHaus at V-Cap and get a pair of his output coupling capacitors. Now, these caps are nose-bleed expensive, but, hey, this is a hobby. So, I had them cobbled in (they are large) damped with some 3M double sided white foam tape, and lived with them for the past 2 months. I auditioned them for some of our SoCal jazz audio junkies who to a man thought the amp is now mind blowingly, jaw-droppingly, excellent. One of our minions just took delivery of a used ASL MG S1 15dt. His is already equipped with a pair of Winged C 6550s. I don't know if he is crazy enough to go with a pair of V-Caps, but it already sounds incredibly good. We have T.H.E. Show Newport audio show going on starting today. We'll make the rounds this weekend and then compare to our gear. Will be fun. For those of you who know that tube amps are inferior, we have a group of educated, practiced audio hobbyists, including lawyers, doctors, brokers, engineers, all in this group appreciate solid state gear, but to a man, this bunch, prefers the sound quality of excellent tube preamp and amplification. Once the cabal is assembled, we'll drag in the M100s and see how they do with the 5 wpc tubie. Too bad, the EP600 will not be here in time for this get together. Anyway, thank you Tash Goka and Chris VenHaus!! Oh, BTW, I'm pretty sure that Pierre Sprey's Clearview Mapleshade Double Golden Helix Plus speaker wires contribute to the awesome sound quality of this system. Tube rolling can be enlightening but tracking down NOS tubes can be difficult/expensive. I have rolled some tubes into my project tubebox seII which I use with my Project MMF 7.1. I even tried some silicon rubber rings on the tubes but could not hear any difference probly cause my ears are failing. I just bought a house and I will finally be able to set up my Pioneer SA 7800 integrated with my HPM 900's and the TT and relive my teen years . I don't buy into the whole cable thing but hey to each his own. I listen to mostly classic rock, metal which doesn't really lend itself to discerning listening. Good to hear your enjoying yourself cause that's what this hobby is all about. My next expenditure will be Atmos which Emotiva will be adding to the XMC-1 in early 2017 (so they say) we shall see. You only live once so screw what others say or think, cause what they think is none of my business. I hate Atmos. Now, I have to redo my HT systems. I have a Music Hall MMF 7.2 turntable with the mojo cart. I like it!! Someday, I'll swap out the mojo for an ortofon black. I also have the mojo cartridge and have looked at the black many times but I am a lowly underpaid mechanic so it will have to wait. William thakker on ebay has about the best prices and I have purchased from him before , good service and fast shipping. I actually bought my TT based on your enthusiasm for it and it is a really nice deck for the money and the Mojo is super quiet. As for Atmos , for the cost I sure hope it lives up to the hype but I worry since my 7.1 sounds really great. I have a Music Hall MMF 7.2 turntable with the mojo cart. Did I miss something right over my head?? 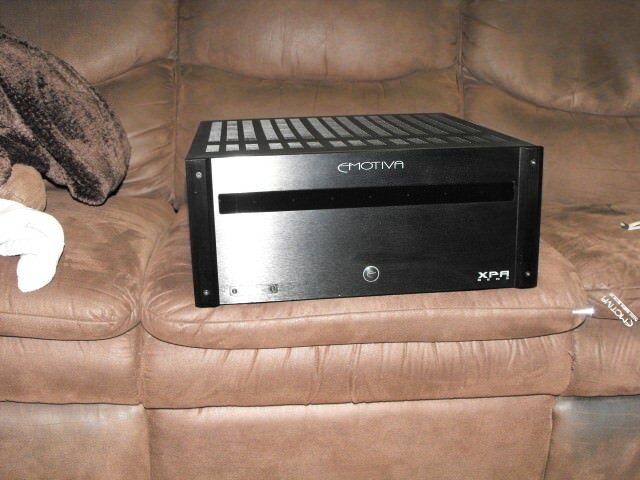 What does Atmos have to do with 2 channel amplification? And how do you get Atmos from a vinyl record? Now I know they did in the past once record quadraphonic onto an album, but i didn't know that Dolby Labs was encoding a form of dolby digital into an analog medium to get the Atmos object based sound. This has me very intrigued. I have an audio obsession. I have four 2 channel systems, 2 HT systems. The HT systems are candidates for Atmos upgrades.